Yet a December 2013 analysis shows more than 3,000 voter registrations statewide listing their residence address at a UPS store, potentially illegally. Florida Law is clear and, with minor exception, requires that voter registrations listing other than an address of legal residence should not be accepted, because they are “ineligible” (F.S. 98.045 (1)(h)). In fact, it’s actually a felony to willfully submit any false voter registration information (F.S.104.011(2)). Accordingly, if these “ineligible” registrations are found to exist, Florida statutes also provide for their prompt correction or removal (F.S. 98.075(6) & (7)). So there you go. 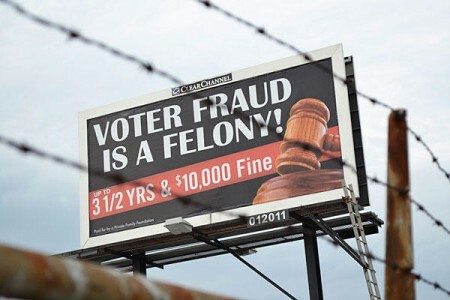 It’s a felony for this to have happened, but how can it be that a citizen watchdog had to uncover this Florida voter fraud while the people paid with our taxpayer dollars have not a clue? Is it not a mandated responsibility of the Florida State Supervisors of Elections to maintain these voter address rolls? I’d say so. …In the case of the UPS store registrations, it’s not a recent phenomenon. More than 2,300 of the more than 3,000 recently discovered UPS store registrations had the exact same UPS store listed as their residence at least 15 months prior. Approximately 800 of those 2,300 likely “ineligible” registrations voted in Florida’s during the 2012 General Election. Voting in this country is practically done on the honor system and what we’re seeing now that outside groups are looking into it is that there are plenty of dishonorable people taking advantage of the system. The sad truth is that Democrats know that and that’s EXACTLY why they’re fighting so hard to block any and all measures that will stop it.